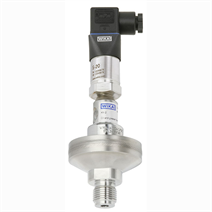 Diaphragm seal systems are used to protect the pressure measuring instrument from aggressive, adhesive, crystallising, corrosive, highly viscous, environmentally hazardous or toxic media. The diaphragm made of stainless steel provides for the separation from the medium. The pressure is transmitted to the measuring instrument via the system fill fluid which is inside the diaphragm seal system. Due to its design, the DSS34T can be used universally and offers the end user the advantage of being able to transmit the measuring signal directly and to combine it with a variety of electrical connections. The DSS34T is ideally suited for demanding measuring tasks and achieves a very high accuracy. It is characterised by its robust design and can be used for a multitude of applications. Mounting of the diaphragm seal to the measuring instrument is made via direct mounting as standard. The DSS34T is particularly well suited for aggressive, contaminated or hot media. This instrument is mainly geared to applications in the chemical and petrochemical industries.